Your Kimberley off-road adventure tour begins when we pick you up from your accommodation at 6am and drive out towards the mighty Fitzroy River, the largest river in the Kimberley. We’ll make our first stop at the Boab Prison Tree in Derby; a tree with an interesting history as it was once used as a prison for aboriginals when they were being transported to Derby. It’s age and size makes it a very impressive tree. Afterwards, we start our off-road adventure on the Gibb River Road, a 660 kilometre dirt road linking Wyndham to Derby. This road is world famous for its spectacular mountain ranges and gorges, its challenging and ever-changing road conditions, and its remoteness from the rest of the world. Our first stop on the Gibb will be Windjana Gorge. As you wonder on the land of the Bunuba people your guide will talk about the remarkable Jandamurra and the Bunaba resistance, that waged a war against the colonial authorities. It’s also a great place to observe freshwater crocodiles. After Windjana Gorge our adventure tour takes us to Tunnel Creek and we sink beneath the Napier Range into the 750-metre long cave system, home to bats and freshwater crocodiles, before heading to our camp. Highlights: Derby Prison Tree, Tunnel Creek, Windjana Gorge, Fitzroy River. 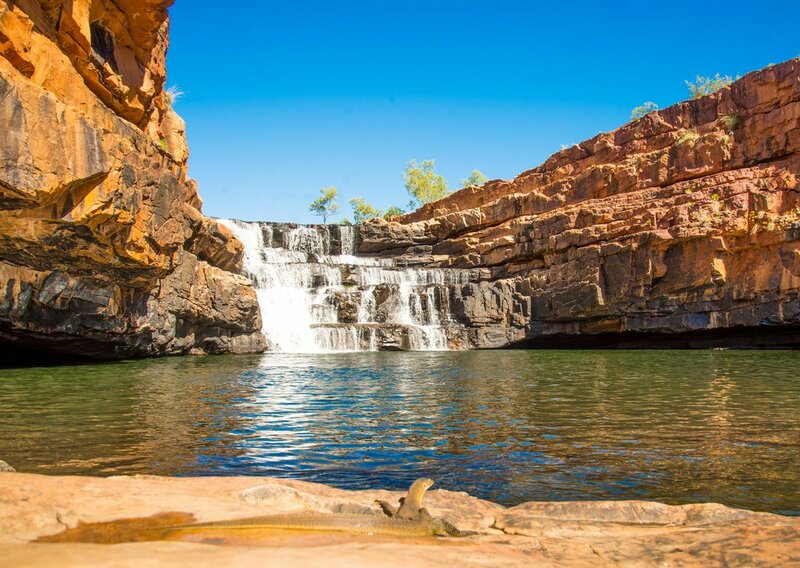 Today our Kimberley adventure follows the Gibb River Road passing through the King Leopold Ranges and Hanns Pass, a natural channel that allowed droving cattle and early explorers the first access into the heart of the Kimberley. We will go for a morning dip at Bell Gorge falls in the King Leopold conservation area. These falls are a series of cascading waterfalls with swimming holes surrounded by colourful King Leopold sandstone and home to many water monitors. Then depending on the seasonal conditions we will head into either Galvans or Adcock Gorge where we will hike past fresh ponds filled with fish and waterlilies before enjoying a swim. We will then make our way to our bush camp. Highlights: Bells Gorge, Galvans Gorge, Adcock Gorge, Windjana rock paintings. This morning we will get up early for a trek into Manning Gorge, where our walk starts with a river boat crossing. We then hike into the gorge where the ancient Bradshaw rock paintings dated back to around 17, 000 years ago can be found. When we reach the gorge there will be the opportunity for a refreshing swim under the waterfall and a chance to spot the Northern Red-Faced turtle that’s found in the area. When we are finished we will continue along the Gibb River Road passing through Mt. Barnett, Mt. Elizabeth and the Gibb River cattle stations, stopping along the way to look at hidden rock art sites and lookouts. Tonight we can enjoy another night under the stars at our bush camp. Highlights: Manning Gorge, Bradshaw rock art paintings, travel the Gibb River Road. Today we travel through Home Valley Station and across the Pentacost River before arriving at El Questro Station. Our first stop is Zebedee Springs where you’ll be able to relax and enjoy the crystal clear hot springs surrounded by towering Livistona palms. Afterwards we will begin a challenging trek through the palm and fern laden El Questro Gorge, working our way over and around the boulders to arrive at a secluded spring-fed waterfall, where you can enjoy a well-deserved swim. Tonight we will camp at the famous El Questro Station where you can quench your thirst at the Swinging Arm Bar and rub shoulders with locals and fellow travellers. Highlights: Zebedee Springs, El Questro Gorge, Pentecost River Crossing, camping at El Questro. Today we hike into the Cockburn Ranges and into Emma Gorge, a pristine swimming hole surrounded by towering cliffs. We then begin a challenging off-road drive, weaving our way through the rugged Osmond Ranges into Purnululu National Park (Bungle Bungles). We will hike deep into the Bungle Bungle Range entering a narrow passage on foot leading us to the Echidna Chasm, where you’ll stand in the centre surrounded by impressive 200-metre high cliffs. We will then head into Mini Palms Gorge where we will view amazing rock formations and see Victoria palms defy gravity as they cling to the cliffs. Tonight we will camp in the Purnululu National Park (Bungle Bungles) in the Kimberley. Highlights: Emma Gorge, Mini Palms, Echidna Chasm, Turkey Creek, camping in the Bungle Bungles. Today we will get moving early so you can watch the colours change on the Bungle Bungles creating an unforgettable sunrise. We then hike through the magnificent domes and visit the natural amphitheatre known as Cathedral Gorge as well as Whip Snake Gorge, the Window and Piccaninny Creek Lookout. You’ll be amazed at the geology and the endemic flora and fauna the domes provide a home to. You’ll also have the option to go on a helicopter flight starting from $269 for an 18-minute scenic flight. Afterwards we will head to our campsite. Highlights: Whip Snake Gorge, Cathedral Gorge, The Window, Piccaninny Creek, opportunity for a helicopter ride. Today we will arrive at Kununurra, the Kimberley’s most eastern town and a place made famous by the Ord River Irrigation Scheme and the Kimberley pink diamond. You will have the opportunity to explore the town before we continue on to Lake Argyle, Australia’s largest man-made lake, where we will have a look around before an optional lake cruise* ($30). We will then venture on to our campsite. Highlights: Lake Argyle, Carr Boyd Range, Durack Ranges. Today we travel to Keep River National Park where we can discover some of the stonemasonry achieved by the Miriwoong and Garjirrabeng people whilst visiting Gingers Hill. We then continue into Jubarra (Gregory) National Park, the Northern Territory's second largest national park. We will stop at Gregory’s Tree, a tree scarred by carvings left by early explorers and travellers. When we have finished here we will venture into the Victoria River region, looking for unique paintings in the dark red sandstone cliffs before heading to our camp. Highlights: Keep River National Park, Gingers Hill, rock paintings, Victoria River, Gregory National Park. Today we will drive towards Katherine and hike up to Baruwei Lookout in Nitmiluk National Park to take in the stunning view over Katherine Gorge. We then continue on our off-road adventure tour and make a stop at Edith Falls for our final swim. Our next stop will be Darwin after taking a stop at the remarkable Magnetic and Cathedral termite mounds on route. You’ll be able to see how the Magnetic termites align their mounds with the magnetic north and observe the Cathedral termites known for building the largest mounds in the world. Highlights: Katherine Gorge, Edith Falls, Cathedral & Magnetic termite mounds, Darwin.